The best beauty is of things as they go. I sing the fading sigh, the falling leaf. Beauty passes, and passing makes it so. The sure opinion and unsure belief. I watch things die where some would watch them grow. Glory comes with whatever comes to grief. And better the mad flight, however brief. Turning waves gold as they break on the reef. I seek the final fire, the final snow. Finality itself is my motif. 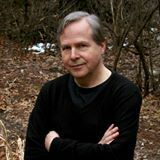 Kurt Luchs has poems published or forthcoming in Former People Journal, Into the Void, Minetta Review, Poydras Review, Triggerfish Critical Review, Otis Nebula, Sheila-Na-Gig, Right Hand Pointing, Wilderness House Literary Review, Crosswinds Poetry Journal, Grey Sparrow Journal/Snow Jewel, and Noctua Review, among others. He founded the literary humor site TheBigJewel.com, and has written humor for The New Yorker, The Onion and McSweeney's Internet Tendency, as well as writing comedy for television (Politically Incorrect and The Late Late Show) and radio (American Comedy Network). In 2017 Sagging Meniscus Press will publish his humor collection, It's Funny Until Someone Loses an Eye (Then It's Really Funny).